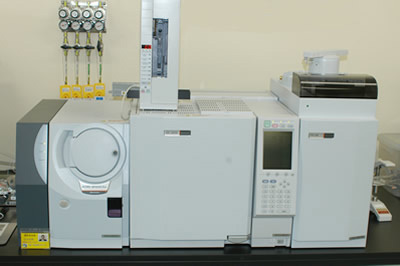 [Gas chromatography mass spectrometer (GC/MS)] Daido Bunseki Research Inc.
A sample is injected into a capillary column with helium flowing through it, and when the column temperature is increased, the sample is separated primarily according to boiling point differences.Separated components are guided to by the mass spectrometer's ion source, and are then ionized by electrons. The formed ions are separated by mass via the quadrupolar mass spectrometer, and then detected by secondary electron multiplier.From the relationship between detected ion mass and intensity, identification and structural analysis can be performed for the sample components. Usage (1) Compositional examination of substrates and additives in solvent, paint, lubricating oil, etc. of the additives and impurities found in fuel, resin, rubber, etc. Mass resolution >=2M (M : Mass), Full width at half maximum.